Boxcutters, Jigger, Shaker Classic/Boston, Citrus Juicer, Strainer, Coupe Glass. Shaken with ice all Ingredients. 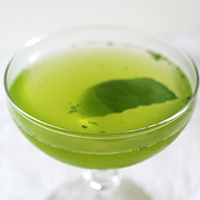 Strain into a Champagne glass, add a few Leaves of Basil, and serve.